Hey! Welcome to my Juicer Reviews and Recipes site! My name is Dan, and I set up JuicerLand.com with my wife Zoe, to share with you our love of healthy juice drinks and everything I know about juicing! 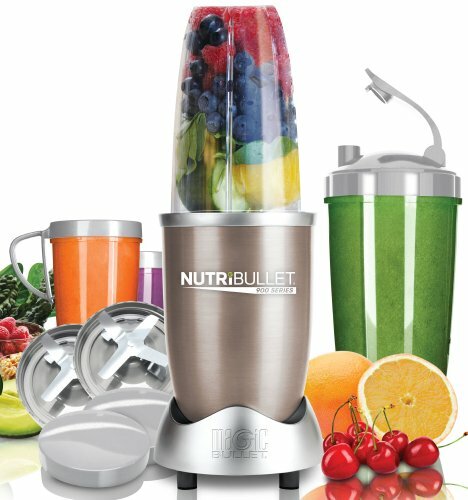 On JucierLand.com you will have access to my favourite juice recipes and detailed reviews on the equipment you will need to create yummy and healthy juices. If you’re looking to buy a juicer, then you have come to the right place! Over the last 18 months, I have tested the majority of the best juicers on the market to help you decide on the best juicer for your needs. There’s loads of juicers on to choose. So many in fact that it can make you feel quite confused, and most of the time people often buy the wrong one for their actual needs. Ideally you should be buying a juicer because you want to improve your diet, health and overall well-being. It should be a long term commitment and not just a once a month activity when you feel guilty about all the bad things you’ve eaten. If you can understand your own needs when it comes to juicing, then you’re on the right road to buying correctly the first time round. Like most things in life, not all juicers are created equal. While they may look similar on the outside, each individual juicer has numerous internal features that make it stand out amongst the crowd. With so many of these juicer’s features having proprietary names or being steeped in terminology that is hard to decipher, it’s no surprise that your average consumer can have a difficult time picking a juicer that is best for him or her. Below, you’ll find eight reviews of juicers that highlight the best parts of each individual product. Keep in mind that no single juicer is better than the other; each has its own set of divergent features that make them appeal more to one group of consumers over another. Regardless of which juicer you buy, you’ll find a high-quality product that will make you a delicious glass of juice you won’t find in the aisle of a grocery store. 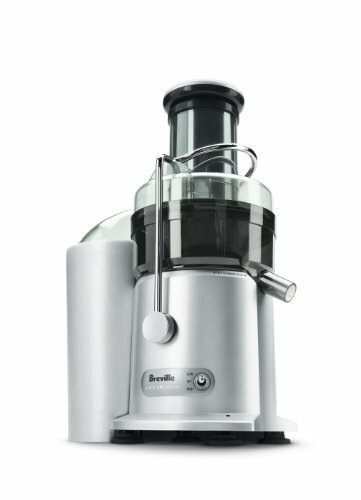 Breville make some of the best juicers on the market, so buying into this brand is not a gamble. For juice-drinkers who love the taste of freshly-squeezed juice but don’t have time to sit around and make it, there is the Breville JE98XL Juice Fountain. With its 850-watt dual-speed motor, stainless steel cutting disc, and extra wide 3-inch feeder chute, the Breville juicer can make juice out of even extra-large fruits and vegetables in just five seconds. If you’re worried that the oversized feeder chute will lead to clogs, know that the juicer has an overload protection LED to ensure you’re not adding too much at once. 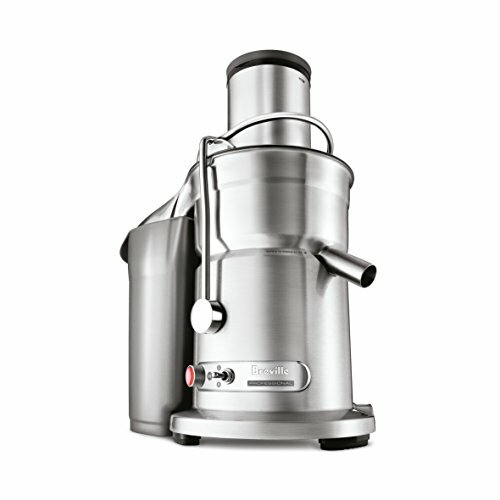 The substantial pulp collector means you’re getting nothing but juice; sorry, pulp fans, but this juicer isn’t for you. When it comes time to clean this juicer, it disassembles into a few different parts, all of which are dishwasher safe. What the JE98XL lacks in features it more than makes up for with its speed. For juice fans who would love to start the day with a fresh cup of juice but don’t have a lot of free time, the Breville JE98XL is going to be the perfect juicer for you. Fitness guru Jack LaLanne may have passed away, but his memory lives on in the Jack Lalanne’s 100th Anniversary Fusion Juicer SLH90 product. Jack LaLanne was a huge proponent of eating healthy and would never turn down any fruit or vegetable; the same could be said about the juicer that is made in his honor. The extra-large, round feeder tube found on this juicer ensures that a wide variety of fruits and vegetables will fit inside this machine. 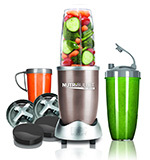 Jack LaLanne was never one to give up, so it should come as no surprise that the juicer doesn’t quit, either and is up there with the best juicers available to buy; the stainless steel blade slices through even the toughest fruits and vegetables, reducing them to a smooth, delicious juice. In fact, you don’t even need to perform any prep work with your vegetables: Just slide them into the juicer whole and the SLH90 will handle all your peeling, coring and chopping needs. To ensure you have something to hold your delicious juice, the SLH90 comes with a large pitcher that catches every last drop of your freshly-squeezed juice. Jack had a penchant for cleanliness, and that is apparent in his juicer as well, offering features such as a no-drip spout. When you’re finished making your juice, clean-up is easy thanks to the dishwasher safe materials. If you take juicing seriously, then the Magic Bullet Nutribullet Pro 900 is for you; after all, it’s the only juicer on this list with “Pro” right in its name! The Nutribullet juicer set comes with 15 pieces, giving you plenty of options to choose from when deciding how to make or serve your juice. Unlike other juicers that sport an array of complicated buttons and features, the Magic Nutribullet Pro 900 offers an intuitive method of juicing that’s as easy to use as pushing and twisting. If you need inspiration for juice mixtures, the Magic Nutribullet Pro 900 also comes with a hardcover recipe book. Inside this recipe book, you’ll find not only classic juice recipes but new recipes involving fruits and vegetables you may not have realized complemented each other. While the Magic Nutribullet Pro 900 is an excellent juicer in its own right, some may argue that the recipe book alone is worth the cost. This juicer is lightweight, easy-to-clean and, above all else, powerful. The Nutribullet brand is synonymous with high-quality juicers and after a few uses of the Nutribullet 900 Pro, it’s easy to see why. When you need the power of a commercial kitchen at your fingertips, you need the Breville 800JEXL Juice Fountain Elite 1000-Watt Juice Extractor. Unlike other juicers with one continuous speed, the 1000-watt 800JEXL juicer features two speeds: 6,500 RPM and 13,000 RPM. Having two speeds allows the 800JEXL to handle both hard and soft ingredients alike. The titanium-reinforced cutting blades ensure that no matter what you put into this juicer machine, it ends up in liquid form. With the extra-wide feeding chute, you don’t need to waste time prepping your fruits or vegetables: Just shove them into the juicer and let this powerful behemoth do the rest. 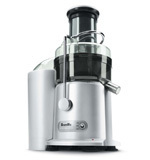 Breville ensures maximum juice extraction thanks to their patented direct central feed system technology. This technology extracts almost all of the nutrients from any given fruit or vegetable, resulting in a rich, vitamin-filled juice that will taste out of this world. You won’t need to worry about pulp in your juice either, with this juicer’s stainless steel mesh filter basket removing almost all of the chunks. This juicer may be powerful on the inside, but that doesn’t mean it’s a slouch on the outside. The die-cast materials used in this juicer’s construction both shine beautifully and also serve as a durable container. In addition, the cord storage features let you safely store the cord when this juicer is not in use. This juicer may be expensive, but for juice fanatics, it’s worth every penny. While a lot of juicers on this list come with proud advertisements promising to remove as much pulp as possible, fans of pulp will want to check out the Omega Juicer VRT350X. This juicer comes with two screens for either fine or coarse pulp control, letting you have as much, or as little, pulp as you want. The low-speed juice squeezing function also ensures that no nutrients are left behind no matter what fruit or vegetable you decide to juice. Not only can this masticating style juicer liquefy most fruits or vegetables but it can even juice notoriously hard-to-grind items, like wheatgrass, on the blender’s highest settings. Although it can be washed by hand, the juicer employs an auto-cleaning system so that you won’t need to clean it as often. As an added bonus, the auto-cleaning system also protects against clogs in the blades. Without a doubt, one of the main advantages this juicer has over the competition is its size. The juicer is compact and lightweight, perfect for those who don’t have a lot of counter space available for yet another appliance. The Omega blender’s small nature makes storage a snap, fitting into most cabinets or cupboards in your kitchen. If you like the features of the Breville 800JEXL but don’t need that much power in a juicer, check out the Breville BJE510XL Juice Fountain Multi-Speed 900-Watt Juicer. 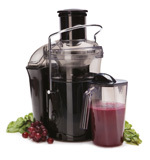 As its name implies, this juicer features a slightly lower motor at 900 watts, down from 1000 watts in the 800JEXL. The unit also features a slightly lower top speed than the 800JEXL at 12,000 RPM, down from 13,000 RPM. However, the device doesn’t skimp on quality, offering just as many, if not more, features than its counterpart. The Breville BJE510 is the perfect juicer for novices, featuring five pre-determined settings that are designed to provide the perfect juice for whatever ingredient you put in. You have standard settings for hard vegetables, citrus products, and soft fruit, along with two settings, Pineapple and Apple, designed specifically for these historically hard-to-juice fruits. Nothing is worse than using the wrong setting with your ingredients and ruining your juice, which is why the BJE510 juicer makes the process as easy as possible. Like other Breville juicers, you’ll find proprietary features like a stainless steel mesh filter basket to filter out pulp and a beautiful die-cast finish that is both beautiful and durable. To assist with clean-up, Breville even adds a cleaning brush, letting you can scrub those hard-to-reach spots that your dishwasher won’t reach. The minute you lay eyes on the Breville BJE820XL Juice Fountain Duo Dual Disc Juicer, it’s easy to see what makes it stand out from other juicers. Instead of the feeding tube being on the side of the device, on the BJE820XL, the feeding tube is directly above the juicer, which Breville claims allows for more effective shredding and juicing than the competition. The extra-wide feed chute and titanium reinforced cutting blades mean that no matter what size or type of fruit and vegetable you use, this Breville juicer will slice and dice it. Even entire apples or tomatoes will fit into this juicer! For softer fruits, such as the mushy banana hiding in the back of the pantry, the puree disc provides the maximum possible yield. This Breville juicer is all about safety, incorporating features like a safety locking arm and an overload protection feature to ensure that both you and your juicer are safe from harm when you use it. This juicer is made from materials that are BPA-free, so you can be rest assured that you or your family are not drinking any harmful chemicals. Finally, the cord storage features lets you safely wrap the cord around the juicer when not in use, keeping it safe from damage. What makes the Jack Lalanne PJP Power Juicer Pro Stainless-Steel Electric Juicer different from the Jack Lalanne’s 100th Anniversary Fusion Juicer SLH90? The answer is silence. This juicer uses a 3600 RPM motor to ensure a quiet juicing experience while still providing maximum yield. As such, this juicer is perfect for those who live in apartments or just want some late-night freshly-squeezed juice. The patented extraction technology found on the PJP Power juicer will extract more vitamins, minerals, and nutrients than the competition. The PLP Power juicer has a lot in common with the SLH90 juicer as well. The PLP Power features a no-drip spout, stainless steel mesh filter, and dishwasher safe materials, so you can spend less time cleaning and more time enjoying your delicious juice. The stainless steel finish on this product lets it blend in perfectly with the rest of your appliances while the large-capacity pulp collector will give you a smooth drink. When silence is important but you don’t want to sacrifice quality juicing or speed, the PDP Power juicer is exactly what you want. Like Jack LaLanne himself, this juicer is built tough and is all about meeting nutritional needs. Getting motivated and wanting to start out on a healthy lifestyle with juicing is the easiest part of the whole process of buying a juicer. When it comes to actually purchasing a juicer, that’s when things can get a whole lot harder for most. The problem is that there are just so many to choose from. The choice available to you is pretty awesome. But with all this choice comes confusion. And to make it even harder, there’s things like juice quality, type of juicer (centrifugal, masticating or triturating) and many other factors that makes deciding what juicer to buy, very difficult. It’s easy to get confused when reading various juicer reviews. In isolation, these reviews are less than helpful, especially if you don’t actually know what you need from a juicer. Feature listings, ratings, and product specifications are important points to know, but when trying to choose a juicer, you should really ask yourself a few questions before you take the plunge and buy a juicer. Take some time out and read the questions below before you head over to amazon and buy your juicer. 1. How Much Time Do You Want To Spend On Juicing? This is normally the one question that people don’t even think about when they are buying a juicer. What you need to know is that not all juicers are quick at producing juice and it’s not until people get home, open the box and start juicing, do they realise how much time and effort goes into juicing. This is even more so when they attempt to juice everyday. If you are thinking about buying a juicer, then please consider the time-consuming nature of juicing and think about what juicer you choose. People who are in a rush in the mornings or who have very busy lives would probably have less than 10 to 15 minutes to spare every day prepping fruit and veg to juice, cleaning the equipment after use and then consuming the juice. For these people the ideal type of juicers to buy would be manual or centrifugal juicers. This is because they are much quicker to juice with and super easy to clean and keep clean. Here’s 3 juicers that are perfect for people with very little time to dedicate to juicing. Very quick and easy to clean, the JE98XL is one of the best juicers for people who have very little time to dedicate to juicing. Easy to clean, but not as quick as some. Quality of juice is high as there’s little heat produced in the juicing process. Quick juicer. Quick and easy to use and clean. Probably the best option for people on the go and who can’t dedicate lots of time to juicing. You could also look at some of the masticating juicers, which normally produce a higher quality of juice simply because they produce less heat that generally reduces the quality of the juice within the juicer. The three listed below are masticating juicers that are relatively quick at producing high quality juices as well as being easy to clean. 2. How Often Will You Juice? Think about how often you plan on juicing. The last thing you want to do is invest in some expensive juicing machine equipment only for your enthusiasm for juicing to disappear and for the juicer to be banished to the basement or in a cupboard somewhere for a forever more. So be honest with yourself and think, “Do I really need to spend $300+ on that top of the range juicer?? You might use it once or twice a day. If so, you’ll need a robust and reliable juicer from a good manufacturer. Forget about own branded juicers, and always go for an established brand with a good warranty and exceptional customer service. A good centrifugal juicers within the price range of $150 to $200 can give you the robustness you need without the worry of breakdowns. If realistically you’re going to be a weekend juicer… then go for something that is below $150 and preferably a manual or centrifugal juicer. For those who are going to dedicate their lives to juicing and want to consume the highest quality juice that you can possibly produce at home, then go for any of these masticating or triturating juicers. They will set you back a fair wedge of cash, but the quality is immense. Juicers vary in price. Not all are the same in overall quality of build or quality of juice. Set a price and stick to it. Don’t be tempted to go for something that is way out of your price bracket simply because the other model has a fancy widget and features that sound good but you’ll probably never need. If you’re a complete newbie to juicing then you’d probably be put off from spending a heap of cash on the more pricer models. But do keep in mind that if you invest in a decent juicer, you’ll probably won’t have to buy another one for many years. Another factor to consider is the ongoing cost of juicing. Buying a cheap centrifugal juicer maybe good in the short term but long term they will not last very long and they are not as efficient as the masticating or triturating juicers. They give a lower juice yield which means that over the years, you’ll most certainly be spending more on fruit & veg than you would if you bought a more efficient juicer. 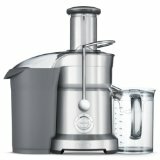 Juicers range from $30 to $600 normally. There’s a big price gap between the top and bottom of the market. Think about what you need from a juicer first and then see what juicer fits your needs as well as your budget. It’s certainly worth thinking about this when choosing a juicer. Not all juicers are easy and quick to clean. Centrifugal juicers tend to be easier to clean, but juice quality isn’t as good as masticating / triturating juicers. Twin gear juicers that cost more than most juicers and they produce the best juice and are sturdy by design, but they are rubbish when it comes to keeping them clean mainly because it takes a lot of time and effort cleaning out the sieves and filters. 5. How quick do you need to drink your juice after it’s made? Juicers all produce different quality of juice. This is down to how well they preserve the nutrients that is found naturally in fresh fruit and vegetables. Centrifugal juicers will produce heat when juicing, which will cause oxidation in the process of juicing. This isn’t great for keeping all those lovely nutrients within the juice. Keeping the juice fresh is vital, and centrifugal juicers fail in this area. That’s why juices that are made with these types of juicers need to be consumed straightaway. There’s no point in making juice then storing it in the fridge, because you lose that vital freshness. If you know that you’re going to consume the juice straightaway, centrifugal juicers such as the Breville range of juicers is ideal for your choice of juicer. If you’re juicing habits lean towards making and storing fresh juices for when you are on the go, for your kids’ lunches or to drink on the way to work, then you’ll definitely be better off with a masticating juicer or a triturating juicer. These types of juicers won’t damage the juice quality with heat as these are “cold press” slow juicers. Juices that are made with masticating or triturating juicers have a much longer shelf life than those made in centrifugal juicers. They are produced with little to no heat, which means there’s less oxidation when juicing and can be stored in the fridge for 48 hours. Most of the Omega range will produce juices that can be stored much longer ( 72 hours ), mainly because they are triturating juicers and can retain their nutrient potency for longer. Triturating juicers produce the highest quality of juice, simply because they take longer to produce juice, thus keeping the temperature down. In the long run these juicers are much better value. 6. Is quality of juice important to you? No matter what juicer you buy, the juice will taste great. That’s really not the issue. When we talk about “quality of juice” we mean the amount of nutrients that is in the juice that you produce from juicing. I’m pretty sure that quality is important to you, but you need to consider actually how much does it matter. Does it matter enough for you to spend an extra $200 on a juicer that produced top quality juice in terms of nutrient retention? If quality isn’t as important to you…then centrifugal juicers such as the Nutribullet or the Breville 800JEXL are a good choice. They are fast at producing juice and ideal for consumption of the juice within 20 minutes of it being made. The juice can come out a bit warm from the heat produced from the motor, but you’ll still get great tasting juices packed with goodness. With the lower end centrifugal juicers, you may find that the juice comes out a bit foamy and the pulp left over is still a bit wet than if you were to use a masticating juicer, which slowly extracts all of the moisture from the pulp. A masticating or triturating juicers are the best choice. They are slower at juicing which makes the quality of juice much much better, as well as increased yield of juice. But with all these plus points, there has to be some give. The give comes in the form of cleaning. Yes it takes much more time and effort to clean a masticating / triturating juicer than it does a centrifugal juicer. The triturating juicers normally have more parts and can take about double the amount of time to clean as a centrifugal juicer would take. So when you do go to buy a juicer, do consider what is most important to you when juicing. It’s all down to you and please note that there are no right answers. It’s just down to your preference and what you want to get out of it. If you get to the point where you really don’t want to compromise on juice quality, juice yield, and dry pulp – then go for the masticating or triturating juicers. If on the other hand you’re busy in your life and do not have the time to dedicate to juicing then get yourself a centrifugal juicer and one that you’ll know will get some use. Remember that the most important thing is that you juice and juice as often as you can. As long as you get that goodness inside your tummy, who cares how awesome your juicer is! 7. What will you be juicing? Triturating / or twin gear juicers will handle anything thrown at it. The powerful twin gears rotate inwards and interlock which causes the fruit / veg to be crushed into pulp. Tough fruit and veg like swede, watermelon rinds, pineapple cores and guava seed get pulverised! If you’re into creating juices from soft fruits or soft greens, then using triturating juicers will be like using a sledgehammer to crack an egg. A blender like a nutribullet or the hurom slow juicer would be a better fit for this type of juicing. This maybe a little confusing for you if you’re not too hot on knowing the difference between a blender, juicer and a food processor. So here’s a little guide to help you get up to speed before you hit the streets to buy one. It’s good to get yourself acquainted to not only the different types of juicers, but how the juicer makes the juice, because not all juicers produce the same quality of juice, even using exactly the same ingredients from the same source! The way a juicer juices your ingredients can have a massive effect on how long the juice will stay fresh for and the amount of nutrients in them. Different types of juicer machines will also function differently. They all have their pros and cons, so it’s all down to you to choose which one will offer you the best results for what you want to use it for. The type of juicer that you do buy should be the result of proper research and based on what you need the juicer for. Any one of them could be perfect for you and your family, it’s just understanding the functions and features to determine which one is better. Keep in mind exactly what you are looking for in the juicer when you do go to buy, as you can easily get distracted by additional features, widgets, bells and whistles. For example, my sister in law only wanted a juicer that pressed oranges and apples, as that’s the only fruit that she likes. Even though she read various reviews and buying guides on this websites, she got taken in by the great looking, expensive, fancy masticating juicer when all she needed was something simple and cheap. So why not get smart and read up on the different types of juicers below, so you don’t end up with a juicer that is way beyond and overqualified for you actual juicing needs. Most people are introduced to the benefits and lifestyle of juicing via a centrifugal juicer. From a Latin root meaning “run/escape” (“fuge”, the same root as the word “fugitive”) from the center (“centri”), centrifugal juicers operate by shredding fruits and vegetables and then spinning them to extract the juice. While there are some variations, most centrifugal juicers operate on more or less the same engineering principle. Fruits and vegetables are introduced at the top of the machine via a feed chute. The fruits or vegetables then drop down onto a multi-purpose metal basket that is spinning at a very high rate. The bottom of the basket contains a shredder or chopper with very sharp blades. The sides of the disc have a very fine mesh. As the blades chop/shred the fruits and vegetables, the juice is spun out through the filter where it then drops down to the spout and into the waiting receptacle. The solid material (called the pulp) is then thrown towards a special collector tank for disposal or re-use. Centrifugal juicers are, by far, the most popular form of juicers primarily because they cost less than other styles of juicers. Centrifugal juicers are sold at a variety of retailers as well as online vendors, making them very easy to find and buy. Available in an extraordinary variety of colors, designs and sizes, centrifugal juicers are very popular for their aesthetic appeal and relatively low “footprint” on kitchen counters. Because centrifugal juicers use a very high RPM motor to extract the juice, they work very fast. With sufficiently succulent fruits and vegetables, it’s possible to extract an entire glass of juice in just a few seconds using a centrifugal juicer. Furthermore, the simple design and operation of a centrifugal juicer makes them easy to use, an additional benefit for individuals first experimenting with juicing and the juicing lifestyle. Thanks to the fact that there are only a few parts in a centrifugal juicer and because most juicers are designed to be safely cleaned in a dishwasher, it’s usually rather simple to clean a centrifugal juicer when you’ve finished juicing. Any time you use a motor spinning at a very high RPM rate, there’s going to be a lot of noise. Even the very best centrifugal juicers produce a lot of sound, a factor to consider when making juice early in the morning or in a home where roommates, family members or housemates may be disturbed by loud noises. Although extremely efficient in producing juice, centrifugal juicers are limited in how efficient they are in extracting juice, a key consideration. An easy rule of thumb to go by when juicing is to measure how dry or wet the discarded pulp is because all remaining moisture content in the pulp equals juice that was lost. Many centrifugal juicers, especially cheaper or less well-designed models, struggle to keep pulp (solid material) out of the extracted juice, leading to glasses of juice that are excessively thick or pulpy. Furthermore, the high speed action of the centrifuge extraction process adds a lot of air to the juice, resulting in an end product that can be very foamy or frothy. Some professional juicing enthusiasts sieve their juice (produced by a centrifugal juicer) through a strainer before serving in order to eliminate both foam/froth and any extra pulp. Due to the nature of moving around material at high speed, the clean up on a centrifugal juicer can be somewhat tedious especially if you’re not using a dishwasher. Bits of pulp and solid material will need to be removed from the interior housing and the pulp receiver/storage area will need to be emptied. One additional matter worth noting in centrifugal juicers is that they are incapable of extracting juice from plant material that has a low moisture content such as leaves (lettuce, rucola, etc), herbs (basil, parsley, etc) and fruits like bananas. Without being unnecessarily crude, a masticating juicer (from a Latin root meaning “to chew”) is designed to simulate the process that goes on inside a person’s mouth in order to separate the juice from the solid material (the pulp). While “masticating” juicer is the preferred industry term for this type of juicer, many juicing enthusiasts and manufacturers prefer to refer to this type of machine as a “cold press juicer” or a “slow juicer”. Almost all masticating juicers start by introducing fruit or vegetables into a horizontal feed chute which then sends the material into a horizontal tube that houses an auger (similar in design and appearance to a screw). The horizontal auger rotates at a relatively low speed (compared to a centrifugal juicer), grinding and crushing the fruit or vegetables while simultaneously pushing it towards the end of the horizontal tube. At the end of the tube is a screen which filters out solid material, extracting only juice at the end and into the waiting receptacle (your glass). The clear benefit to upgrading to a masticating juicer is that this design is far more efficient at extracting juice than a centrifugal juicer. The slow but thorough design of using an auger to crush fruit and vegetable material results in extremely dry pulp, indubitable proof of the efficiency of this type of juicer in separating the liquid content from the dry material in plant matter. Less dry material means less organic material lost combined with a greater efficiency in extracting every drop of juice from fruits and vegetables. Most masticating juicers can easily extract juice from even low-moisture content plant material like leaves (lettuce, rucola, etc), herbs (basil, parsley, oregano, etc), soft greens (like wheatgrass) and fruits such as bananas. In addition, masticating juicers can serve as a dual use kitchen appliance, able to make nut butters (by crushing the solid material and extracting the oil instead of juice), baby foods (a puree of fruits and/or vegetables), and sorbets using different attachments. Some masticating juicers even come with an attachment so that they can be used as a pasta maker. Furthermore, the low speed action of a masticating juicer ensures that the liquid content of fruits and vegetables is never heated enough to cause enzyme deterioration or destruction. One of the primary benefits of juicing is the preservation of living enzymes in the plant material to be consumed via the juice. Juice produced in a masticating juicer also has a longer “shelf life” and can be stored in a refrigerator for a long period of time than juice extracted with a centrifugal juicer. The low speed operation of masticating juicer in combination with a well-designed housing usually results in a far quieter operation than with a centrifugal juicer, an important consideration for individuals wishing to make juice early in the morning or at times when loud noises emanating from the kitchen are a factor. While many masticating juicers are quite affordable, even the cheapest models are usually more expensive than centrifugal juicers. While the primary benefit of a masticating juicer is its efficiency in extracting juice, the slow RPM of the auger(s) means that the entire process takes far longer than with a centrifugal juicer. It usually only takes a few minutes to extract a glass worth of juice but this may be too slow for individuals who are pressed for time, especially in the morning before work or school when a lot of juicing is done. More moving parts means that there is more to disassemble and clean on a masticating juicer. Although many models come with a cleaning brush and other specialty tools, it should be remembered that disassembling, cleaning, and then drying the various components of a masticating juicer requires a greater commitment than with most centrifugal juicing machines. Triturating juicers are considered to be the elite models in the juicing world. In chemistry, to triturate something means to grind it to a fine powder, but when referring to juicers the term generally means a very high-end twin auger masticating juicer. Technically speaking, there is no agreed-upon difference between a triturating juicer and a twin auger masticating juicer. Nonetheless, the designation of a juicer as a triturating machine means that it uses two augers to more efficiently extract juice and usually implies that it is a high-end appliance with a better design, more functions, and adjustable settings. Furthermore, most triturating juicers come equipped with two gears (often described as twin gears). A higher speed gear handles softer, more succulent fruits and vegetables while a lower speed with greater torque is designed to extract juice from low-moisture content plant material like leafy greens, bananas, herbs, and wheat grass. With a number of different settings, different attachments, and a variety of filters, triturating juicers are designed for juicing enthusiasts who want a combination of extremely efficient juice extraction and fine control over the juicing process. More powerful motors and greater juice extraction functionality due to the twin auger design mean that triturating juicers use less energy to extract juice while also creating less heat, thus minimizing the amount of enzyme damage to and oxidation of the extracted juice. Most triturating juicers come with hefty user manuals, a necessary item to help the operator maximize the efficacy of the juice extraction process. Some triturating juicers differential themselves from masticating juicers not only by having two gears and two augers but also by adding a cutting or slicing action simultaneous to the crushing action achieved by rotating the two augers. In addition, some higher-end models of triturating juicers use magnets at the end of the extraction tube to more efficiently extract minerals from plant material. Similarly to masticating juicers, most triturating juicers can double as other types of kitchen appliances, using attachments to make nut butters (extracting oil from nuts instead of juice), sorbets, sauces, pate, baby food and pasta. Some triturating juicers also come with attachments to extrude bread sticks or rice to make rice cakes and other products. The strength of having two gears and twin augers mean that triturating juicers are generally able to successfully extract juice from even “difficult” fruits and vegetables, including celery, bananas, herbs, and leaves. Furthermore, because the twin auger and double gear system is more powerful, triturating juicers often require less pre-preparation of fruits and vegetables, meaning less time spent cutting up hard vegetables like carrots before introducing them into the machine. The slow speed operation of a triturating juicer means that these machines generally create far less noise than other types of juicers. Triturating juicers are universally the most expensive models of juicers on the market. While the inclusion of two gears (or “three” if the reverse function is counted), two augers, adjustable settings, and a large number of attachments makes triturating juicers the most efficient type of juicer on the market, this sophistication often comes with a hefty price tag. The number of moving parts and attachments make clean up of a triturating juicer the most labor intensive of any other type of juicer. While most parts can be successfully placed in a washing machine, disassembly, drying and re-assembly is an important issue to consider when buying a triturating juicer. Triturating juicers are usually also the slowest type of juicer, taking several minutes to extract a single glass worth of juice. Triturating juicers are definitely not recommended for individuals with time-sensitive schedules for making a quick glass of juice. Because of the triturating juicer’s extreme efficiency of slicing, crushing, and cutting fruits, these machines generally are not recommended for use with citrus fruits in order to avoid having pulverized seeds introduced into the extracted juice. Juicing has come a long way since the days when twisting an orange was considered an exotic drink. Today, nutritional experts have discovered that juicing fruits and vegetables is one of the best ways to optimize health, lose weight, and protect against a number of diseases and ailments. By unlocking the micronutrients and vitamins contained in fresh, organic fruits and vegetables, juicing is now considered a key element in living a long and healthy life. In the past, it was often thought that a cooked vegetable retained the same level of nutrition as a raw one. Now we know that consuming fruits and vegetables in their pure, raw state via juicing is the only way to ensure that sensitive micronutrients are preserved and not damaged by heat. Around the world, health authorities recommend that adults get between 5 and 10 servings of fresh fruits and vegetables a day. Unfortunately, most people in the western world rarely consume the bare minimum. With juicing, it is easy and fun to get an entire day’s serving of fruits and vegetables in minutes. For individuals who have consumed a poor diet for years, the digestive system becomes degraded, making it harder to absorb the nutrients from their food. Juicing converts fruits and vegetables to a state which is optimum for absorption, making sure that your body gets the full benefit of vitamins, minerals and other essential nutrients. Even people who are steadfast in consuming vegetables as part of their daily diet usually eat the same half dozen vegetables in their salads or other dishes. Juicing allows people to widen their options, combining high-nutrient vegetables like kale and wheatgrass that would be hard to eat on their own with perennial favorites like carrots and celery. Most nutritional experts recommend that people eat one pound of raw vegetables for every 50 pounds of body weight but few people are able to chew through that many vegetables. Juicing makes it simple and fun to eat not just the recommended minimum but a true abundance of fresh, raw vegetables in just a single meal. For individuals who are seeking to limit the amount of carbohydrates and fat in their diet, juicing is ideal. Most fruits and vegetables are almost completely fat-free and basic nutritional guides make monitoring carbohydrate intake via juicing a very simple and delicious process. Due to strict regulations about industrial food processing, it is next to impossible to buy unpasteurized juice from a restaurant or grocery store. Juicing at home allows you to extract all of the delicious nutrition from fresh, organic fruits and vegetables without losing any vital enzyme activity in the pasteurization process. Whether you’re trying to lose weight, reduce the symptoms of a chronic ailment, or simply want to move forward towards a healthier lifestyle, juicing is a great first step. After getting in the habit of consuming fresh-made fruit and vegetable juice, it is much easier to take additional steps to improve your lifestyle and diet. Today’s advanced juice machines give everyone the ability to extract the valuable minerals and vitamins in fresh produce. From the comfort of your own kitchen, it is now easy and convenient to get a full day’s serving of fruits and vegetables.